Hydrangeas are one of my favorite flowers. I know that I say that a lot, but flowers are a very easy thing to like, so naturally I have a lot of favorites! One of the gorgeously unique things about hydrangeas is the incredibly vibrant blues and purples that the blooms can be. I have designed paper hydrangeas in the past, but here is a great option to make the hydrangeas in tissue. Hydrangea petals are very delicate, and tissue paper is able to capture that fragility in a really beautiful way. So here is my newest flower: tissue paper hydrangeas! As you may have heard, my team and I have just released our new line of tissue paper packs. The most exciting part about this is that each tissue pack comes with an exclusive project template. Our Fresh Breeze tissue pack features a color palette with cool ocean blues and pretty seafoam greens. 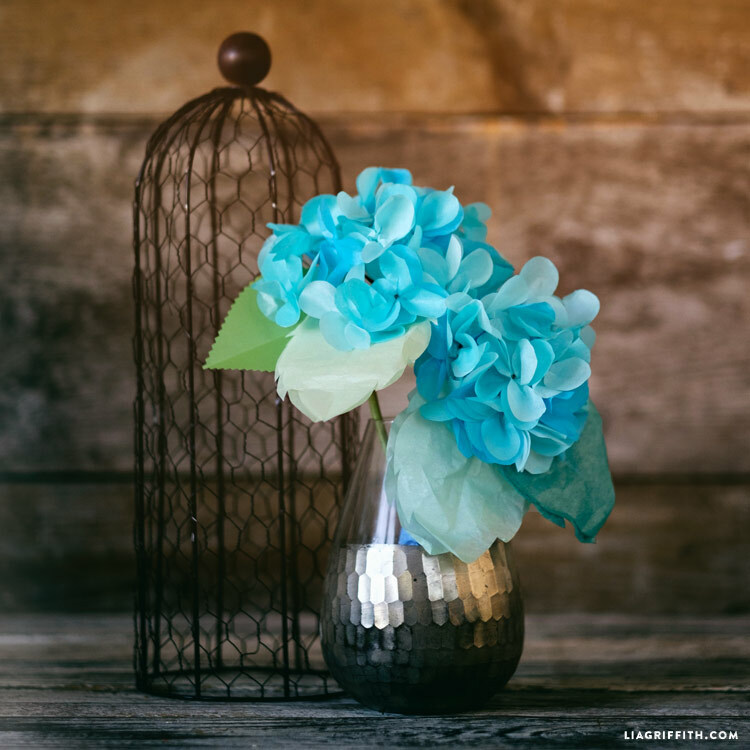 This pack includes the template to make these lovely hydrangeas for your DIY home decor. Hydrangeas typically bloom in late spring and summer, so this is a great way to keep them around all year long! I love blue hydrangeas because to me they are one of the more intriguing blooms in nature. 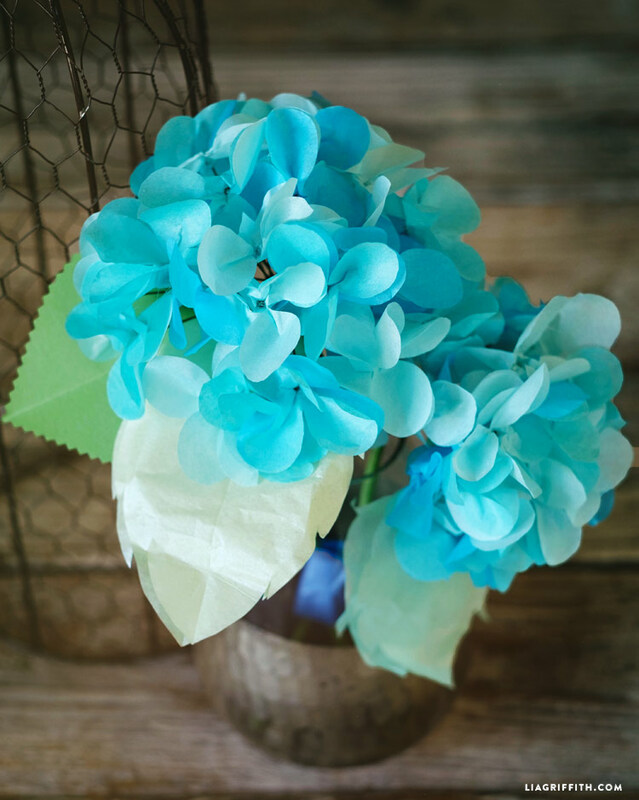 To make these tissue paper hydrangeas, start by cutting out the template included in the tissue pack. Before cutting, I recommend scanning the template into your computer and saving just in case you ever misplace the printed template! Find the exclusive project template with the tissue paper pack! I bought the tissue paper templete. It came with the tissue paper and the pattern but no instructions. I don’t want to have to pay to download the instructions on here. Are there more detailed instructions or are the ones from the pictures it? Hi Tracy, you can use the photo tutorial and download the written instructions for free. I am finding the application of petals to floral wire somewhat confusing .I place 2 petals on wire, glue, make a loop. I read somewhere that you pinch base of petals, although that is not in these instructions .Are there only 2 petals on each wire? Hi Jane, yes the downloadable instructions do mention pinching the petals in step 5 (sometimes the download instructions contain a few extra details– a bonus for members). There are 2 petals per wire. Hi Sofia, I just uploaded a template with a better explanation of the cutting. You should get a flower with 4 petals when you’re done– don’t cut along the bottom of the folds, that’s what will keep all 4 petals in tact. Thank-you! This helps a lot! How do you keep from having a glob of glue that shows in the center of each petal? I really don’t use much glue on my tissue projects, so try starting with just a small dab and go from there! 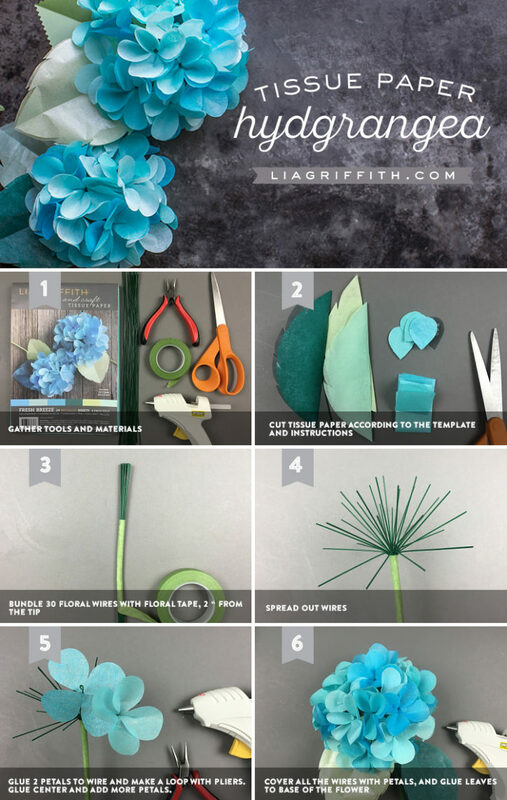 Hi Lia, can i make this Hydrangeas with crepe paper instead? So very pretty — but disappointed that in order to get the pattern I need to buy your tissue paper. However, I went to another tutorial and will use the template you provided there. I could not find a template for this?????? Sorry about that, it’s there now!